Jason Burns, a history teacher at Hopkins Academy in Hadley for nine years, says it’s becoming more difficult to get students interested in the workings of the American government, but there is hope. Seven years ago, Burns said in a recent interview, Hopkins Academy cut its only American government course. A graduate of UMass-Amherst with degrees in history and education, Burns said the choice to drop the course was based almost entirely on lack of student interest. “Students refused to engage,” Burns said. According to him, it wasn’t their fault. The course, he said, was taught like a standard history lesson—an approach that leaves students without anything to latch on to. Curious about whether students could be engaged by American government studies, Burns applied to a federal program with that goal in mind: the Federal Trials and Great Debates Summer Institute, held in Washington, D.C. in June. The program brought together high school teachers from around the country to develop lesson plans based on high-profile court cases and the balance of competing interests in the U.S. legal system. The American Bar Association, in partnership with the Federal Judicial Center, chose 20 teachers from a pool of more than 70 applicants. The teachers explored landmark cases, visited sessions of the Supreme Court to watch decisions being handed down, and met with Supreme Court Justice Ruth Bader Ginsburg. In examining court cases, including the 1928 wiretapping case, Olmstead vs. the United States, and the 1971 Pentagon Papers case, teachers looked for way to make the historic legal battles relevant to students today. For Burns, the meeting with Justice Bader Ginsburg gave him a new perspective on how to teach the material: in hearing the Justice’s views on dissent, Burns said he recognized the importance of examining all the bits of these cases, not just the ruling. He said he tended to look at dissenting opinions as “not necessarily that big of a deal,” but Bader Ginsburg illuminated the importance of dissenting positions in the development of future law. In his experience, Burns said, students gravitate toward tension. The clash between justices in cases that saw both the high court and the nation deeply divided, Burns said, has the best chance of raising questions relevant and compelling to students. As he prepares for the new school year, Burns said he’s trying to work what he learned in Washington into his teaching. Rather than give a play-by-play on how the Pentagon Papers case turned out, for example, he said he plans to begin by asking the students about another case with which they may be more familiar: the Edward Snowden espionage case. “I would start with a question like ‘Should the NSA be allowed to collect metadata?’ The gut reaction is, of course not, but what do you think the court will say about this?” He said he will try to get students to surface the important questions raised in the Snowden case—”Should [national security] rules apply the way they are? Should they be changed? Should we allow a wider array of ways for the government to collect information?”—and then to look for similar questions raised in the Pentagon Papers case. It’s seeking participation from students like this that Burns said he hopes will strengthen the social sciences in a time when there are fewer students pursuing the humanities and less funding to strengthen them. Data from the American Academy of Arts and Sciences reveals that funding for the National Endowment for the Humanities, a grant-making agency providing funding for state humanities councils, has fallen from an inflation-adjusted high of $400 million in the late ‘70s to $150 million in 2014. This theme carries over into higher education, where the percentage of bachelor’s degrees in the humanities has fallen from 14 percent in 1966 to 7 percent in 2010. Burns said this has an effect in his classroom. While schools focus less on the humanities, especially history and social studies, he said students have become more apathetic towards learning about and taking part in government. 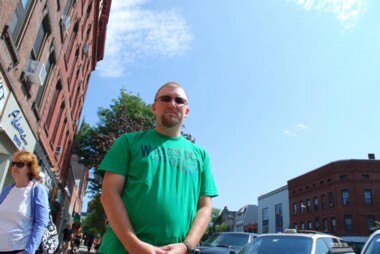 “I think we’re losing that feeling of civic responsibility,” he said.